Summary: Transcription of the the Will of John Mutlow of Bosbury dated 2nd May 1604 listing as the main beneficiaries his wife, Anne, and his children Martha, Henry, Catherine, Anne, Elizabeth (Bevans) and William. The will is held at Herefordshire Archive and Records Centre, Hereford reference 7/1/30. In the name of God Amen the second day of May in the year of our Lord Christ 1604. 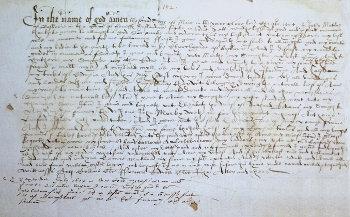 I John Mutlow of Bosbury in the county of Hereford, husbandman, sick in body yet nevertheless of good and perfect memory thanks be given to Almighty God do make and ordain this my testament containing herein my last will in manner and form following. First I give and bequeath my soul to Almighty God my creator and my body to the earth to be buried in the churchyard of Bosbury. And I dispose my worldly goods in manner as followeth. I give and bequeath unto Martha, my daughter, my best cow and to Catherine, my daughter, my other cow. ItemI give and bequeath to Henry, my son, my heifer, three swine, a malt mill, a mustard mill, all my tools and implements of husbandry and half my tools of coopery and this my house wherein I now dwell, together with all buildings and lands with all and singular th’appurtances thereunto belonging during the natural life of Anne, my wife, to maintain the said Anne in meat, drink and apparel and all other necessaries during her natural life. ItemI give to Anne my daughter my coffer standing next unto my chamber door. Item I give and bequeath unto Elizabeth, the wife of Richard Bevans, my daughter, 43 shillings 4 pence in money the which one John Morley oweth me for the payment whereof Anthony Harford Esq hath undertaken. And I give unto the said Elizabeth one of my young swine. And I give and bequeath to William, my son, the other half of my coopery tools and all my benches, forms and table boards to be delivered untothe said Wm. after the decease of Anne my wife. Item I give and bequeath unto Henry, my son, a hand barrow, a wheelbarrow, my ladders and my vat at Mr Harford’s, three hogsheads and nine barrels. And after my debts paid and my funeral expenses performed, I give and bequeath all the rest of my goods whatsoever unbequeathed unto Anne my wife. And of this my last will and testament, I do make and ordain Henry Mutlow, my son, my sole executor. And I utterly revoke and annull all and every former wills, gifts, legacies and bequests by me in any wise before this time made, named, willed and bequeathed. Witnesses Anth. Collins, clerk, Francis Cowell, clerk, John Allen and others.